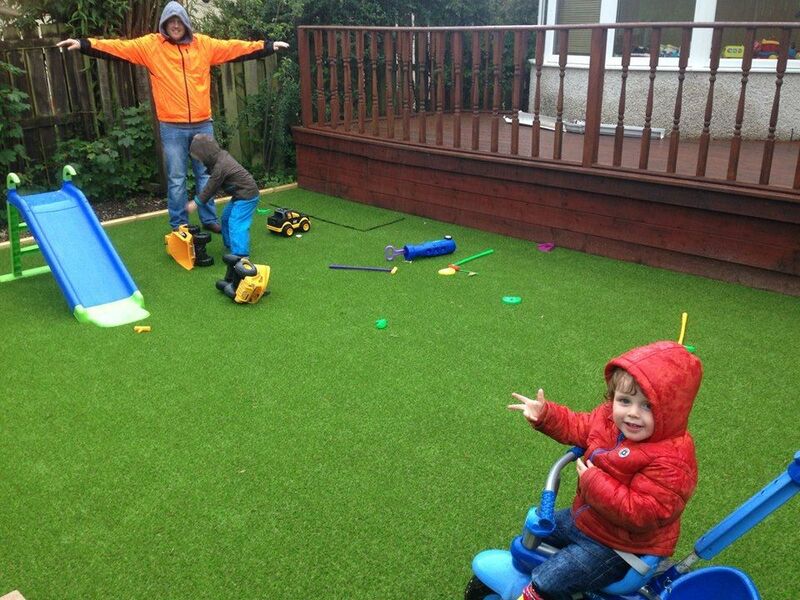 We design, supply and install artificial grass play areas for both homeowners and commercial customers throughout Scotland who are looking for the perfect play area for children of all ages, year-round, without the hassle of constant maintenance. The installation is of the highest quality, carried out by an experienced team who can carry it out quickly and efficiently, with minimal disruption at competitive prices. Artificial grass is ideal for children’s play areas as it allows them to play safely, without risk of hurting themselves. Our artificial grass can come with a cushioning underlay that helps ensure children don’t suffer any nasty injuries if they have a fall whilst playing. Our artificial grass is laid without lumps, bumps or trip hazards that you may have with natural grass with tufts, this reduces the risk of children tripping or falling. Children can play on artificial grass all day long without parents having to fear grass or mud stains on their clothes that can lead to them being consigned to the bin. This is especially useful during the wetter months during which traditional grass can become very muddy, meaning you have the choice of keeping children indoors or dealing with the mess they will return in. Our artificial grass has a 10-15 year manufacturers guarantee, meaning you don’t have to worry about garden maintenance for a long time and can focus on your play area being enjoyed without it being made out of bounds immediately after cutting for fear of grass stains. The artificial grass we use is more than capable of standing up to the rigours of children playing relentlessly, it is designed to be hardy and stand the test of time. Our team of artificial grass specialists seek to understand each customers specific requirements for their play area, whether it is for a home-owner or commercial customer, in order to create the design and find the artificial grass that suits them best. Installation is undertaken at a time that suits you and will be completed in a timely and professional manner so as to minimise disruption while maintaining our high standards.